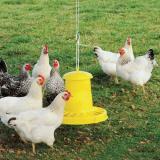 Use these feeders for small to mid-size flocks. 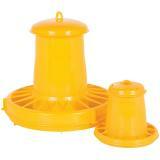 Our birds love these feeders! Preferred feeder for small to mid-size poultry farms. Comes complete with base, tower and lid. 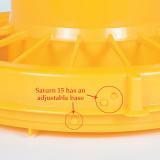 Saturn 15 features an adjustable base design allows for up to 4 flow levels. Top lip around base helps prevent feed waste. 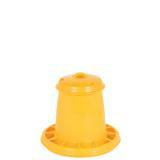 Has a small rain hat that allows it to be used in light rain. 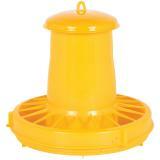 Hang the feeder just above the bedding to reduce feed spoilage. 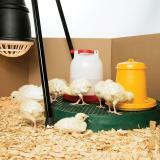 Hang by using heat lamp clip. Or, place on bricks or blocks instead of hanging. Use caution when adjusting base; plastic is pliable but will break if abused. Number of reviews: 45 customers reviewed this product. Recommended: 40 out of 45 said they would recommend this product to a friend. I bought one of the Saturn 15 feeders last year. This year I'm adding to my flock, so I needed another feeder to make sure all of the chickens could get to the food. I didn't hesitate to get another Saturn 15! I love that the Saturn 15 has a top on it that keeps rain from getting into the main chamber! I had lost a LOT of feed from using a feeder without a lid to prevent the water from getting into the feed and causing it to mold. 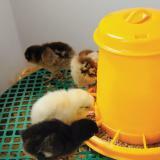 Plus, with the feeders holding more feed, there are fewer trips to the coop to fill them up. It's a win win situation! 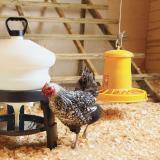 I have 2 of the larger Saturn feeders for my two hen houses with standard size hens. I absolutely love them. No food waste. 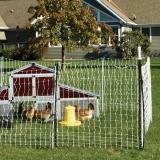 However, I just purchased the smaller Saturn for my separate Bantams, Silkies and Game birds. They eat the layer pellets as well and the pellets do not fall through the bottom slot as they do on the larger Saturn. You cannot adjust the bottom on the smaller Saturn so I find myself shaking the feeder many times a day to get pellets to fall out to the feeding section. I'm sure it would work well with crumbles, but I do not use crumbles for my layers. Great feeder. 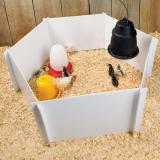 The top is great for keeping the birds from roosting on top and in turn pooping in the main food storage area. This feeder has more than paid for itself by keeping the feed in the feeder and not on the ground. 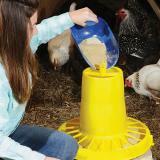 I have used most every kind of feeder for my chickens. I have replaced all the chicken feeders with this one. The small one is great for chicks. The oldest ones are over two years old and going strong. Easy to put together and adjust. Super easy to keep filled.